A stylized portrait of Count Johaan Feracci painted in 723.M41. It hangs amongst the portraits of other patriarchs of the noble family in the ancestral mansion on Belliose III. Count Johaan Davide Feracci is the patriarch of the most powerful Imperial trading family in the Corvus Cluster. As a distant relative of the House of Feracci, one of the great Navigator Houses in the Imperium, Johaan is a titled nobleman. This grants him a seat on the Imperial Council of his home world of Belliose III, in the Belliose System. Born in 685.M41, Johaan was a handsome and gifted child who showed superior intellectual prowess and excelled in his privileged education. That success, however, obscured a slothful and discontented nature that manifested itself during his adolescence. Bullied by a demanding and callous father, Johann responded with a self-destructive passive-aggressiveness that is common among emotionally abused adolescents. His energies soon diverted from his education to such undesirable pursuits as alcohol, drugs, pleasure slaves, and, eventually, minor criminal activity. Life changed dramatically for the young nobleman in 715.M41 when he took control of his family’s trading interests upon the untimely death of his father, Mattaus, who was murdered. A number of family members–at least those who have recognized the value of discretion–whisper that the timing of Mataus’ death was fortuitous for Johaan. Prior to his death, the father was preparing to disinherit his son. Here is how Count Johaan Feracci will appear on the tabletop. 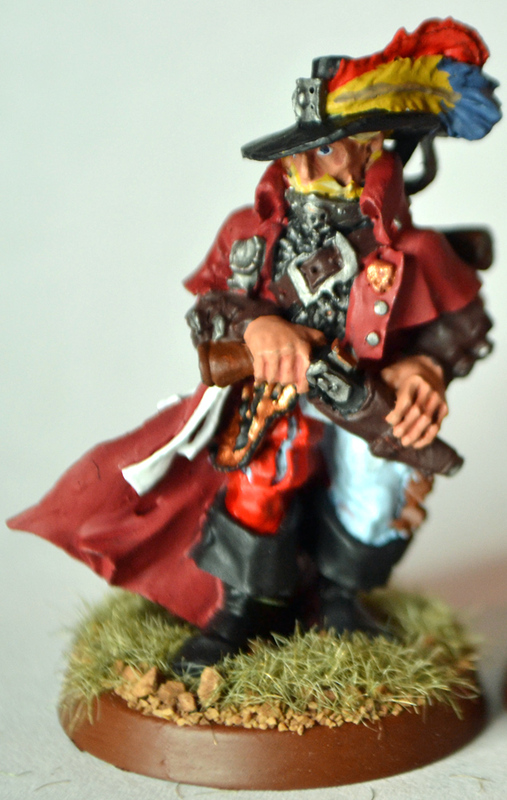 The figure is a Witch Hunter from Games Workshop. This family drama arose because of young Johaan’s increasingly frequent visits to the House of Subtle Delights, a disreputable pleasure house with a clientele favoring the most debased forms of entertainment. Johaan’s increasingly violent treatment of pleasure slaves forced Mattaus to pay sizable bribes to the owners of the pleasure house to avoid a public scandal. Before he could make good on his threat of disinheriting Johaan, Mattaus was found dead in his private chambers. By his corpse, a jokaero death spider was found, seemingly crushed by Mattaus in his final struggles. Alas, his victory over the robotic assassination device had failed to prevent it from injecting its victim with zarthax, one of the deadliest poisons in the galaxy. Inheriting his father’s title, Johaan–given his past self-destructive behavior–confronted considerable resistance within the family to his inheritance, including direct control of the family’s extensive trading empire. But the young count appeared invigorated by the challenges of his new social position, and he revealed a ruthless determination–backed by bribery and murder–to deal with his opponents. An unexpected talent for business, which dramatically improved the family’s financial position, also helped cement the enthusiastic support of those family members still alive. Today, Johaan is a man of 50, although rejuvenat treatments have allowed him to maintain an appearance in this late 30s. He is a handsome man, with thick blond hair and a sizable moustache–in the latest style fashionable among the Belliose aristocracy. As with other aristocrats, he is drawn to the more flamboyant and outrageously expensive attire that visibly distinguishes him from the poor rabble who work as laborers. Johaan’s wealth rests upon events long before his birth. Millennia ago, a child was born on Holy Terra without the Navigator’s Gene, the mutation that allows a Navigator to guide a ship through the Void. This was a notable failure of House Feracci’s sophisticated breeding program, but in those years, the practice of infanticide was not yet common. So the child was transported to the far end of the galaxy and, upon reaching maturity, was granted an Imperial Warrant of Trade to provide a livelihood. Retaining the Feracci name, this child and his offspring spent centuries building a formidable trading empire across the Corvus Cluster, garnering considerable economic and political influence–and even maintaining a friendly if distant relationship with the original Navigator House. Indeed, this relationship has been mutually useful: Johaan’s family has obtained some of the finest navigators in the galaxy, and the trading house has willingly represented House Feracci’s interests in the region. No member of Johaan’s direct line has ever been born with the Navigator’s Gene, however. and Johaan has no known psychic ability. Although highly successful, Johaan has shown signs of discontentment over the years. He is arrogant and condescending to others, and demanding and short-tempered with social inferiors, other family members, and staff and servants. That said, Johaan has a pride in his aristocratic roots and believes that the social elite have some responsibilities to those who serve them. Thus he can be cruelly critical to a servant one day; provide the finest medical care to that servant’s sick child the next day. Although a frequent participation in the social events of the aristocracy, he has kept his distance socially from individuals. He has never been known to have friends. His only serious diversion from his work is occasional visits to the House of Subtle Delights–a vice that he privately loathes but cannot entirely give up. Although enjoying great success in recent years, there is one small annoyance in Johaan’s life. His trading empire has lost a number of highly profitable business opportunities to a young Rogue Trader, Adeon Drake–a charismatic and irreverent scoundrel who owns but a single merchant ship. Drake has become a thorn in the side of Johaan, and the two once fought a sword fight in one clash over an ancient treasure. That said, both men appear to welcome their increasingly deadly rivalry, if only for the challenge it offers. Left to his own devices, Johaan was destined to live a long and comfortable life as a privileged aristocrat, albeit one who would have little lasting impact on the history of the Corvus Cluster. But that changed in 735.M41 when he was introduced to the Lady Adriana. A woman of exceptional beauty and sensuality, Adriana has assumed an incredibly influential–if not entirely wholesome–role in the count’s life. It is now frequently commented by family and acquaintances that the two are now virtually inseparable. THEGM: Oh, there is so much more to this story–and so much more to come. Unknown even to Johaan, Adriana is a daemon of Slannesh. Through her “charms,” she intends to use Johaan to provide her with an entertaining and very destructive experience during her time in the material universe. The fate of Johaan is very unclear in 735.M41.